The big, furry Chewbacca is a great addition to your Star Wars group costume. 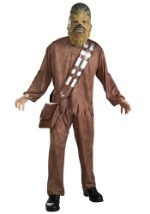 We've got Chewbacca adult costumes ranging from inexpensive Halloween styles to authentic replica costumes for collectors, and we also carry affordable child and toddler size Chewbacca costumes. Or, select one of our authentic Chewbacca masks. We're ready to help you become the galaxy's most famous Wookiee.